^ a b NatureServe (2013年). "Amia calva". IUCN Red List of Threatened Species. Version 2014.3. International Union for Conservation of Nature. ^ a b c d e Kenneth Stewart; Douglas Watkinson (3 May 2004). Freshwater Fishes of Manitoba. Univ. of Manitoba Press. p. 51. ISBN 978-0-88755-374-5. http://books.google.com/books?id=VyzuWkePgtsC&pg=PA51. ^ Froese, Rainer, and Daniel Pauly, eds. (2009). "Amiidae" in FishBase. January 2009 version. ^ a b c d e Jay Stauffer (1 December 2007). Fishes of West Virginia. Academy of Natural Sciences. p. 40. ISBN 978-1-4223-1783-9. http://books.google.com/books?id=ATYnjnKaFlcC&pg=PA40. ^ a b c d e f g Ken Schultz (15 December 2010). Ken Schultz's Field Guide to Freshwater Fish. John Wiley & Sons. p. 64. ISBN 978-1-118-03987-8. http://books.google.com/books?id=jXkW9mYqP8oC&pg=PA64. ^ Nelson, Joseph S. (2006). Fishes of the World. John Wiley & Sons, Inc.. ISBN 0-471-25031-7. ^ Gene Helfman; Bruce B. Collette; Douglas E. Facey; Brian W. Bowen (3 April 2009). The Diversity of Fishes: Biology, Evolution, and Ecology. John Wiley & Sons. p. 37. ISBN 978-1-4443-1190-7. http://books.google.com/books?id=FyehAR6hsUUC&pg=PA37. ^ a b Hedrick, MICHAEL S., and DAVID R. Jones. (1999). 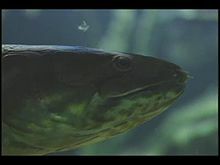 “Control of gill ventilation and air-breathing in the bowfin Amia calva”. The Journal of experimental biology 202 (1): 87-94. http://jeb.biologists.org/content/202/1/87.short. ^ D.C. Jackson, C.G. Farmer (March 5, 1998). “Air-Breathing During Activity in the Fishes Lepisosteus Oculatus and Amia Calva”. The Journal of Experimental Biology (201): 943–948. http://jeb.biologists.org/content/201/7/943.full.pdf 2014年6月8日閲覧。. ^ a b c d e f g h i Stephen T. Ross (2001). The Inland Fishes of Mississippi. Univ. Press of Mississippi. p. 94. ISBN 978-1-57806-246-1. http://books.google.com/books?id=WEaKXWRt10kC&pg=PA94. ^ Wilfred T. Neill (1950). 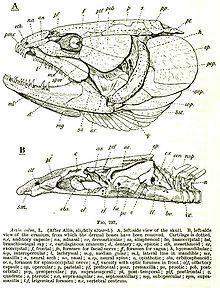 Copeia, 1950, An estivating bowfin. American Society of Ichthyologists and Herpetologists. p. 240. http://books.google.de/books?id=eVeaSqFy2VgC&pg=PA21&lpg=PA21&dq=neill+1950+An+estivating+bowfin. ^ Wolfgang J. Plunk, Peter B. Bayley, Richard E. Sparks (1989). ﻿The Flood Pulse Concept in River-Floodplain Systems﻿ (Report). University of Florida. p. 117, 8-pdf. http://floridarivers.ifas.ufl.edu/RiverClass/Papers/Junk_et_al._1989.pdf. ^ McKenzie, David J., and David J. Randall. (1990). “Does Amia calva aestivate?”. Fish physiology and biochemistry 8 (2): 147-158. doi:10.1007/BF00004442. ^ Gene Helfman, Bruce B. Collette, Douglas E. Facey, Brian W. Bowen (2009). The Diversity of Fishes: Biology, Evolution, and Ecology. Wiley-Blackwell. p. 257, Chapter 13. ^ Paul J.B. Hart, John D. Reynolds (2002). Handbook of Fish Biology and Fisheries. Wiley. p. 27. ISBN 0-632-05412-3. http://books.google.com/books?id=oh4owuHzz2IC&pg=PA27. ^ Guang-Hui Xu, Li-Jun Zhao, Michael I. Coates (May 2014). “The oldest ionoscopiform from China sheds new light on the early evolution of halecomorph fishes”. Halecomorphi. doi:10.1098/rsbl.2014.0204. http://royalsocietypublishing.org/content/10/5/20140204. ^ Arratia, Gloria (2001). “The Sister-Group of Teleostei: Consensus And Disagreements”. Journal of Vertebrate Paleontology 21 (4): 767–773. doi:10.1671/0272-4634. ^ Imogen A. Hurley, Rachel Lockridge Mueller, Katherine A. Dunn, Eric J. Schmidt, Matt Friedman, Robert K. Ho, Victoria E. Prince, Ziheng Yang, Mark G. Thomas and Michael I. Coates (February 2007). “A New Time-Scale for Ray-Finned Fish Evolution”. The Royal Society Proceedings: Biological Sciences 274 (1609): 489–498. doi:10.1098/rspb.2006.3749. http://www.jstor.org/stable/25223804. ^ Broughton, Richard E., et al. (2013). “Multi-locus phylogenetic analysis reveals the pattern and tempo of bony fish evolution”. PLoS currents (5). doi:10.1371/currents.tol.2ca8041495ffafd0c92756e75247483e. ^ Faircloth, Brant C., et al. (2013). “A phylogenomic perspective on the radiation of ray-finned fishes based upon targeted sequencing of ultraconserved elements (UCEs)”. PloS one 8 (6): e65923. doi:10.1371/journal.pone.0065923. ^ Mulley, John F., Chi-hua Chiu, and Peter WH Holland. (2006). “Breakup of a homeobox cluster after genome duplication in teleosts”. Proceedings of the National Academy of Sciences 103 (27): 10369-10372. doi:10.1073/pnas.0600341103. ^ a b c John Acorn (7 February 2007). Deep Alberta: Fossil Facts and Dinosaur Digs. University of Alberta. p. 10. ISBN 978-0-88864-481-7. http://books.google.com/books?id=FX7toAVTaVYC&pg=PA10. ^ a b c d Rudolph John Miller; Henry W. Robison (2004). Fishes of Oklahoma. University of Oklahoma Press. p. 58. ISBN 978-0-8061-3610-3. http://books.google.com/books?id=5durXXnIWKsC&pg=PA58. ^ a b c d e f g Freshwater Fishes of South Carolina. Univ of South Carolina Press. (2009). p. 80. ISBN 978-1-57003-680-4. http://books.google.com/books?id=fVZHbQ7eJLQC&pg=PA80. ^ Joshua Laerm; B. J. Freeman (January 2008). Fishes of the Okefenokee Swamp. University of Georgia Press. p. 37. ISBN 978-0-8203-3135-5. http://books.google.com/books?id=8S7A45Gix6MC&pg=PA37. Catherine A. McCormick. 1981. Central Projects of the lateral line and eight nerves in the bowfin,Amia Calva. The Journal of Comparative Neurology 197:1-15. J.M. Conlon, J.H. Youson, and J. Whittaker. 1991. Structure and receptor-binding activity of insulin from a holostean fish, the bowfin:Amia Calva. Biochem J. 276:261–264. T. M. Nguyen, T. P. Mommsen, S. M. Mims, and J. M. Conlon. 1994. Characterization of insulins and proglucagon-derived peptides from a phylogenetically ancient fish, the paddlefish: Polyodon spathula. Biochem J. 300(Pt 2): 339–345. J. M. Conlon, J. H. Youson, and T. P. Mommsen. 1993. Structure and biological activity of glucagon and glucagon-like peptide from a primitive bony fish, the bowfin: Amia calva. Biochem J. 295(Pt 3): 857–861. Sepkoski, Jack (2002). “A compendium of fossil marine animal genera”. Bulletins of American Paleontology 364: 560. http://strata.ummp.lsa.umich.edu/jack/showgenera.php?taxon=611&rank=class 2011年5月17日閲覧。.